Poddu (Pottu) Amman surrenders to GoSL? (January 12, London, Sri Lanka Guardian) It is reported that the GoSL Defence Secretary and brother of Sri Lankan President – Gotabhaya Rajapakse is currently on a personal trip to the US. The Defence Secretary is a US citizen who started his career as gas station attendant in the US after retiring from the SLA. Over the course of many years in the US, Gotabhaya progressed on from humble beginnings to the IT field, and is reported to have done professionally well in his last job as an UNIX Systems Administrator. The Sri Lankan defence establishment is eagerly awaiting his return from the US so that he can effectively direct the MOD (GosL Ministry of Defence) in handling the Poddu Amman affair - which so far they have done a shoddy job. The absence of the Defence Secretary is a contributing factor to the non release of Poddu news to the media as the whole of the MOD is in a dilemma on what direction to take. The scene at MOD is that of a herd of sheep awaiting their shepherd. Wanni sources have indicated to the EFT that Poddu Amman is being treated well by the SLA military intelligence and is cooperating with various other intelligence outfits. The Indian security apparatus, primarily RAW is known to be engaged in intense discussions with the SLA Military Intelligence wing. RAW is reported to have requested the extradition of Poddu Amman to India to face criminal proceedings there for Poddu’s hand in the assassination of former Indian Prime Minister – Rajiv Gandhi. The congress led Indian government is very keen on seeing Poddu face trial. It is worth noting here that India and GoSL does not have an extradition treaty currently in place. The pro congress Tamil Nadu (TN) politicians are said to have expressed displeasure at RAW’s current moves as over 95% of Tamil Nadu voters support the LTTE’s liberation struggle. The Tamil Nadu politicians are also not happy that the Poddu Amman affair is being swept under the carpet by the GoSL. They would like to see the affair made public so that they can galvanise TN support for and display solidarity with the supreme leader of the LTTE. In the current theatre of operations, the blog owner can confidently report that the LTTE is fiercely resisting SLA advances. The LTTE has resisted attempts by the SLA to advance east of Iranamadu and along the A35. EFT reported on two key events in the past week i.e., the SLA commando infiltration attempt at Puthukkudyiruppu and the rescue of stranded cadres in EPS. 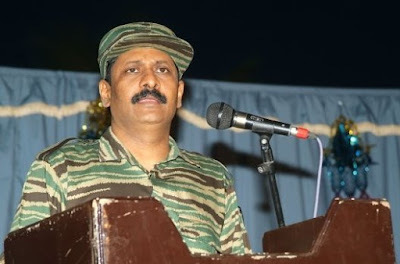 The SLA commando infiltration attempt is related to the surrender of Poddu Amman, and the EPS rescue is cross verified by the fact that the GoSL has declared that the cadres withdrew to Mullaitivu, and further that only a few Tiger bodies were recovered in EPS. EFT has heard of a rumours circulating that Colonel Soosai, commander of the Sea Tigers is getting ready to defect with around 1,000 cadres. Our Wanni sources could not confirm or deny this rumour and would only go on to say that Col. Soosai is still executing his duties. Col. Soosai was commended for his coordination efforts in the successful docking of two ammunition and weapons bearing vessels that pierced through the Indian and SLN blockade and unloaded its cargo at an undisclosed location. The source further added that Col. Soosai managed to patch up the strained relationship between the supreme commander and Velavan Master – former Kilinochchi in charge. The supreme commander has expressed his renewed confidence in Velavan Master.